It’s been rather quiet on the chocolate front this month. Everyone’s away on holiday or otherwise enjoying themselves. However, we’ve still managed to get 14 lazy chocolate recipes in. As you’d expect for the holiday month, most of the entries are no bake or easy bake. They all look delicious. There’s a bit of a cereal theme running through the recipes, but also a courgette one. August is the month for courgette gluts after all. Cherries are also in season and we both start and end the entries with Black Forest inspired creations. Thanks to all the bloggers who share their fantastic recipes with #WeShouldCocoa and provide inspiration for the month ahead. If you’d like to join in with next month’s #WeShouldCocoa, scroll down to the bottom of the post and you’ll find the September link-up. If you haven’t joined in before or need a reminder, you can find the guidelines on the We Should Cocoa page. If it’s ice cream your after for the holiday season, don’t be fooled by these Black Forest ice cream styled cupcakes over at Only Crumbs Remain. They look pretty convincing to me. Weetabix and chocolate is a new one on me, but these chocolate weetabix squares from Mummy Mishaps sound quite fabulous. As a big fan of Tunnock’s Teacakes, it’s no surprise that Claire made this astonishing Tunnock’s Teacake croquembouche to celebrate five years of her blog, Foodie Quine. I used cornflakes to make this cinnamon coconut chocolate crunch extra crunchy. They worked well, but were way too tempting. Low in calories and high in protein, these flour less mint chocolate courgette muffins from Proper Foodie sound both healthy and delicious. These gluten free cacao-courgette breakfast cake bars from Gluten Free Alchemist have some of my favourite ingredients – chocolate, roasted hazelnuts and peanut butter. What a splendid way to start the day. 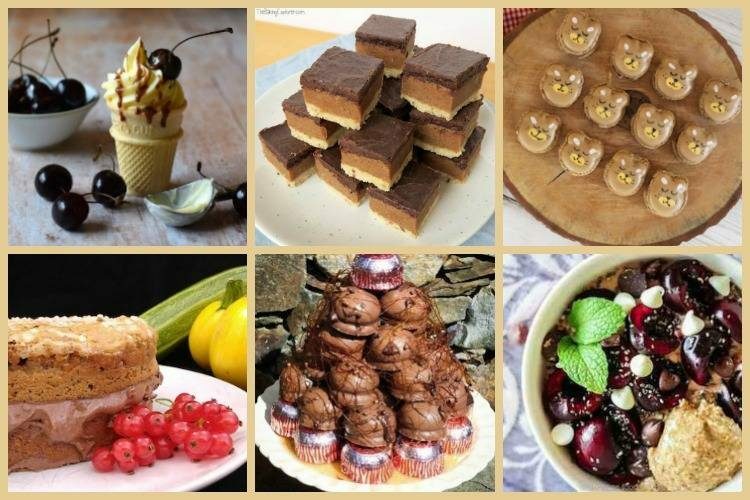 For a healthier take on one of the sweet treats we Brits love so much, try these no bake vegan millionaire’s shortbread over at The Baking Explorer. Oh those pesky summer colds! Over at The Beach Hut, it was all about snuggling up on a wet day and curing the sniffles with a rich chocolate and coconut cake. It just happens to be naturally gluten free too. Lucy’s chocolate peanut butter cornflake slice over at Baking Queen is the sort of thing I would demolish immediately given half a chance. It’s a no-bake slice, so ideal for a hot lazy August. Why go hunting for bears when you can make your very own chocolate bear macarons? Find out how at Emily’s Recipes and Reviews. The courgette glut is usually at it’s highest in August. This vegan chocolate chip courgette cake with chocolate coconut cream from The Peachicks Bakery is a good way to use some of them up. Whoa! Who can resist millionaire’s shortbread? Certainly not the kids over at Apply to Face Blog. These chocolate courgette rye muffins from Sneaky Veg are sweetened with banana and honey and sound delicious. Fancy Black Forest gateau for breakfast? Well maybe not, but these cherry chocolate Greek yogurt bowls from Because Food Is Love sound like the way to go. 14 Lazy Chocolate Recipes. PIN IT. Thanks Jenny. Everything looks very appealing and as ever, I wish I could try a bit of everything. Ooh aren’t those chocolate Bear Macarons just so incredibly cute! Aren’t they just? And so are you ice cream cones too. A lovely round-up of delicious recipes. That’s definitely a great improvement on boring Weetabix. I had it this morning, and thought again, it’s like eating a soggy cardboard, yuk. Will try to join in this month. I only had Oreo white chocolate fudge post last month, and wasn’t sure if it fits. I haven’t had weetabix for years. It was the only cereal I was allowed when I was young, so I do have quite good memories of it. Yes, white chocolate is fine for #WeShouldCocoa. It always does Kat – so very tempting. Thanks for your delicious contribution. What a super roundup full of delicious recipes to die for. Thanks for hosting! There’s always so much temptation to be had. Much as I want to try everything, it’s just as well I can’t.